Weston joined Bradley, Drendel & Jeanney in 2015. She represents clients in personal injury cases, including motor vehicle collisions, products liability, and premises liability. Weston is a fourth generation Nevadan and a third generation Nevada attorney. She received her undergraduate degree from Fordham University in 2010 and her law degree from the University of Nevada, Las Vegas - William S. Boyd School of Law in 2013. During law school, Weston received CALI Excellence for the Future Awards for trial advocacy, remedies, and insurance law. 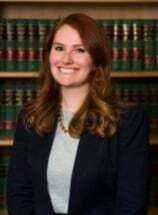 Upon graduation from law school, Weston worked at the Second Judicial District Court for two years, where she served as a law clerk for two District Court judges. As a native Renoite, Weston is an avid skier and hiker, and loves to explore the outdoors with her husband and dogs, Ruby and Benny. Weston also has a deep love for the arts and frequently performs in various theatre productions throughout Reno.